The 26-year-old centre-half has signed a five-year deal with the Championship club. Clark at St James' Park. 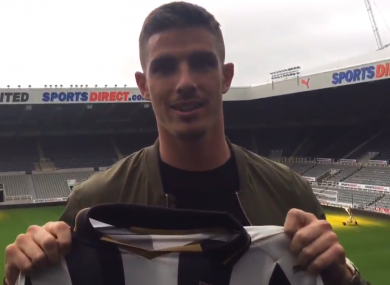 NEWCASTLE UNITED HAVE announced the capture of Ireland international Ciaran Clark from Aston Villa. The defender has put pen to paper on a five-year deal after the Championship club, who were relegated along with his former side Villa at the end of last season, paid around £5 million (€6m). 26-year-old Clark joined Villa’s academy as an 11-year-old and went on to make 158 first team appearances for the Midlanders. He is also capped 19 times for Ireland and featured in the first two games at Euro 2016. Magpies boss Rafa Benitez is building a squad with the aim of getting the club promoted straight back up to the Premier League and Clark has decided to link up with him despite Villa boss Roberto Di Matteo hoping he would stay. “Newcastle is a massive club so I’m really happy to be here,” said Clark. “Importantly, it is a club that is moving in the right direction and pushing for the right things, so I’m really excited to now be a part of that. Benitez added: “Ciaran is a very versatile player, as a left-footed centre-back he can also play left-back and also as a defensive midfielder. Email “Ireland defender Ciaran Clark leaves Villa for Rafa Benitez's Newcastle ”. Feedback on “Ireland defender Ciaran Clark leaves Villa for Rafa Benitez's Newcastle ”.